Some facts about the trio... Harrison got 2 front teeth on Christmas day.... yep we all sang the song "all I want for Xmas is my 2 front teeth" He was surprisingly unfazed and wasn't terrible distressed by the event. Our little princess Anastasia is officially crawling... she gets so excited though she often reverts to flapping... and then she growls till she gets moving again. She is also the speed queen in the walkers.... she is going to be a real handful later when she gets mobile! Oliver is still the chilled out baby... he really enjoys slowly assessing things and then decides if he likes it or not or if he will do it... like the walkers.... now he tries to run away from you laughing as he goes! Solids are a part of life now with them having 3 meals aday... Oliver really loves the sweet stuff and will adamently shake his head and close his mouth till he gets desert. We have had to resort to all sorts of trickery to get him to eat the savoury stuff... alternating sweet/savoury, giving him his own spoon, ect! Harrison will eat anything and latches onto the spoon with a snap while Anastasia will eat most but would rather be feeding herself. On the sleeping we are doing mostly great... though lately Harrison thinks it is time to get up and play at 4.30 am! Trying desperately to get him to go back to sleep and often he will for 20-30 minutes but then starts again wanting to play. We put up with this untl about 5.45 -6am and then I get them out for their morning bottle... would love to know how to get them to sleep until 7 am! But as they go to bed between 6-6.30 I can't complain. We do have the occasional wakeup and dummy run but most nights are great. 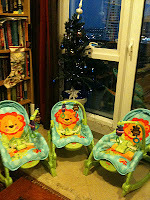 For those who saw our entry in December 2010 you will now see the same rockers... with the best Christmas present we have ever recieved. 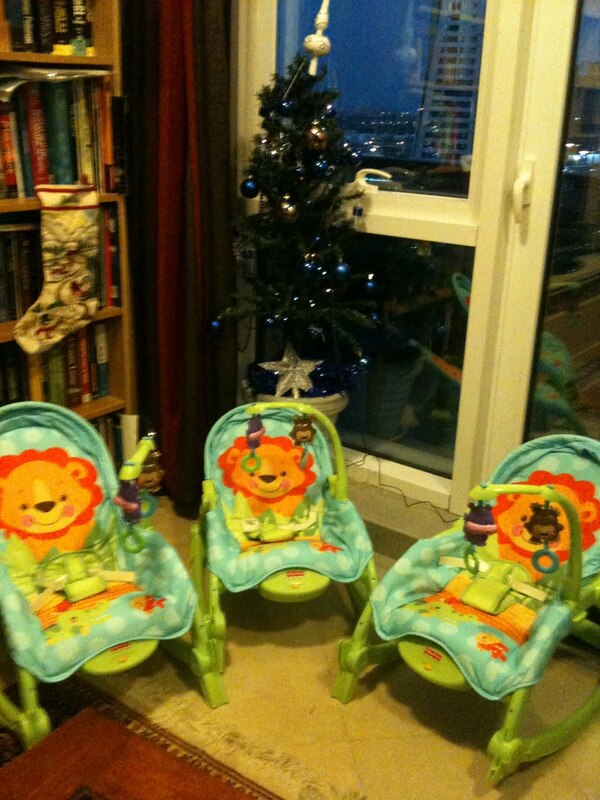 Harrison, Anastasia and Oliver ... best pressies ever! Our own play station 3! Enough for now.. time to get some sleep before the trio decide to awake and cause trouble... al with a delightful smile while they do it!